AMS is meeting in Atlanta this week as the north gets buried in snow and cold continues. The academics though still are pushing their agenda making the meeting uncomfortable for those who don’t buy into the scam. Many skeptics have left the society. Many like me remain because we have earned a CCM, a Broadcast Seal or CBM, designation as a Fellow. We will prevail. For 19 going on 20 years, global warming has stopped. Cooling has replaced warming in winters during that same period for the CONUS - we will update after this year for 20 years). 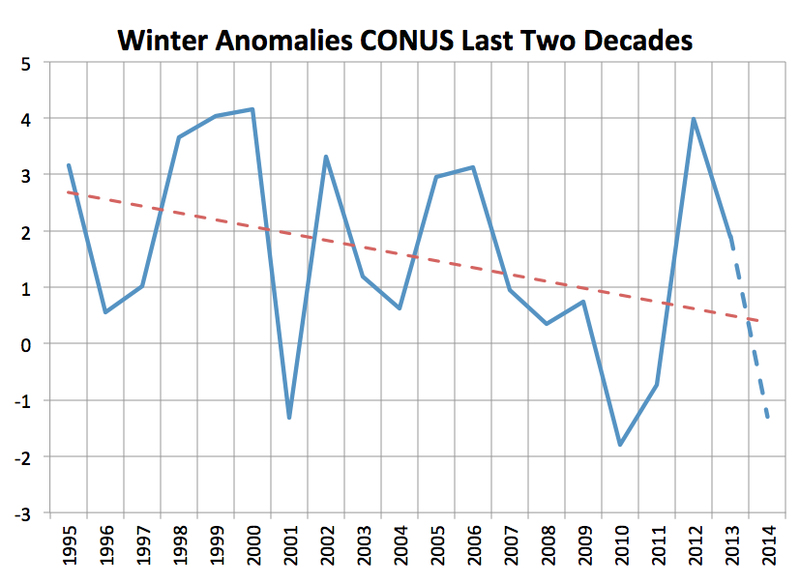 Using projected February anomalies and anomalies to date it will rise to -1.25F/decade cooling for the last 20 winters. This has been true even as CO2 has risen 9.7%. In Europe and in places elsewhere including the US, the green agenda has led to harmful increases in the cost of energy or energy shortages, as winters have trended colder and snowier. 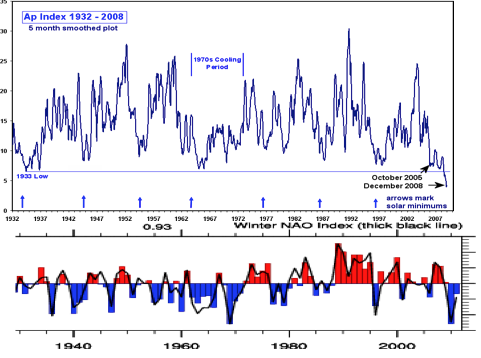 This has falsified the climate models and assessments which had accelerated warming and snowless winters. In the United States, the number of high heat extremes have been declining since the 1930s. 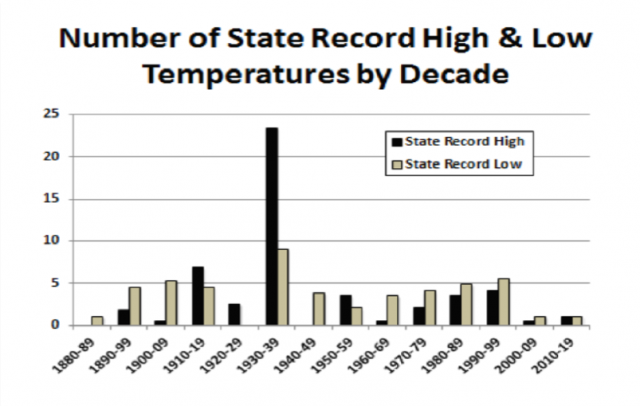 23 of the 50 state all time heat records occurred in the 1930s and 39 before 1960. More cold than heat extremes have been set since the 1940s. The claims to high temperature months and years is with "adjusted" (manipulated) data. The actual heat and cold records are unadjusted. The tropical heat build-up in the atmosphere and oceans, one of the key outputs in ALL the climate models, has not been seen in the weather balloon, satellite data, or the dense ocean buoys used to track El Nino and La Ninas down to 300 meters depth, in the last 3 to 5 decades or 2000m in the ARGO buoy data since its implementation in 2004. Sea level rise has slowed dramatically from the 20th century, and there is no upward trend in incidents of droughts and floods. Hurricane activity globally is at a 34 year low. "Superstorm" Sandy was a borderline Category 1 storm. Eight Category 3 or greater storms hit the Atlantic coast from 1938 to 1960. The total tornado count this year was over 140 incidences less since records started in 1953. The number of wildfires are the lowest since modern records began in 1985. The arctic ice cover bounced back over 50% with one of the coldest arctic summers on record while new records for ice were set in Antarctica, even trapping a research ship this past month, during the Antarctic summer. Snow was supposed to become increasingly rare. Instead as this week will reinforce, it is increasing. 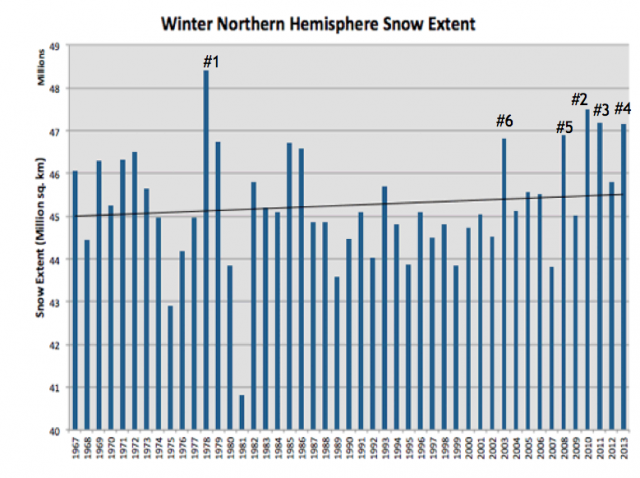 4 of the top 5 snowiest years for the northern hemisphere have been in the last 6 years. 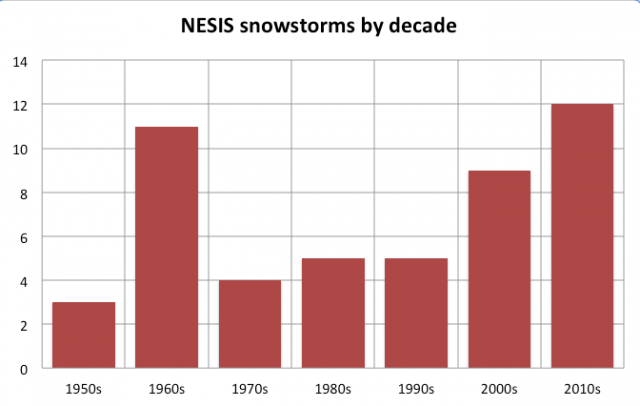 In just 4 years, we have had more east coast snowstorms this decade than any in history. The great physicist Richard Feynman said not matter how smart you are, who you are or how beautiful your theory, if data doesn't support your theory, it is wrong. Einstein noted a model or a hypothesis cannot "prove" anything. But data can invalidate a hypothesis or model. Einstein described the "Key" to science well when he said: "The case is never closed." "Many experiments may prove me right but it takes only one to prove me wrong." In the case of global warming, we have many examples proving it wrong, but with the political motivation of heavy funding, exceeding $79B the last decade, data is ignored with claims of a consensus. Dr. Michael Crichton wrote "Historically the claim of consensus has been the first refuge of scoundrels; it is a way to avoid debate by claiming that the matter is settled." By claiming both sides of every weather extreme (warm or cold, drought or flood, no now or too much snow), they have created an unfalsifiable hypothesis. They want you to believe every weather event proves their hypothesis. The most recent example is the controversy over the "polar vortex". Though this is a common phenomenon, somewhere around the hemisphere most every winter, and has occurred in the United States often in the cold decades, as well as the last decade, they believe they can convince you that (You and your SUV are responsible). This weekend, I enjoyed meeting with a friend (PhD climatologist) from the Weather Company (TWC etal). 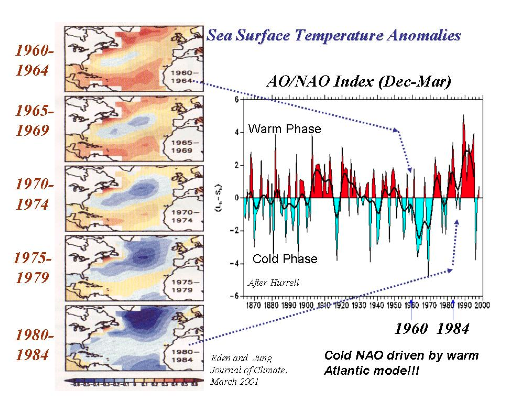 Some outspoken TWC mets have convinced themselves that AGW is real because of the extremes (which in reality have not increased as discussed above) and the negative North Atlantic Oscillation in recent years they relate to the arctic warming and melting of arctic ice which has resulted in inconvenient colder winters in varying parts of the northern hemisphere. My friend told them they need to look further back in time. He is absolutely right. 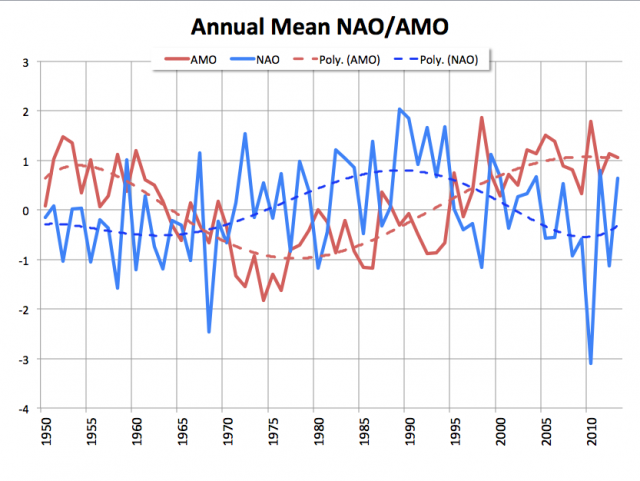 The arctic ice and warming relates to the AMO, and warming and melting happened before when the AMO was last in its warm mode from the 40s to 60s when winter turned colder and blockiness increased. 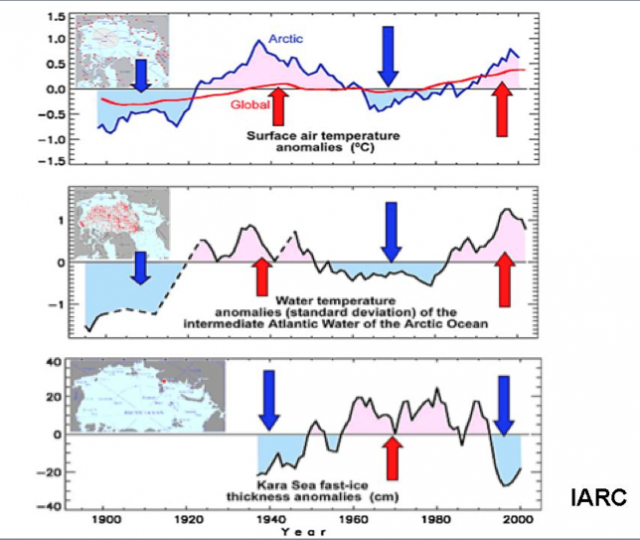 The University of Alaska at Fairbanks shows how warmer Atlantic waters make their way into the arctic increasing ice melt (from the bottom) and air temperatures. It appears also influenced by the geomagnetic solar activity. Our quiet sun in recent years and reduced geomagnetic Ap aligns with a declining NAO much as we have seen in similar circumstances in the past. A Hypotheses is only one possible explanation for some observations in the real world. The hypotheses can only be meaningful when it is tested and the results match both the original and the projections based on the hypotheses. The hypotheses of the greenhouse gas effect has never been able to be tested and match the results expected.Thus the hypotheses is falsified. The greenhouse gas effect does not exist- therefore using the term "greenhouse gases" is false. Almost everyone says that because certain gases have been proven to absorb IR radiation especially CO2, Methane and a few thousand other gas that the effect exists, however not one of the other features can be demonstrated. There are both experiments and examinations of the laws of physics and thermodynamics that prove that the greenhouse gas effect can not happen. Therefore greenhouse gases do not exist, what does exists is IR absorbing gases. here are a few references to back up this position. Many more are available. Second Law requires a closed system, which the Earth clearly is not. This is a commonly misunderstood Law which is also often misused to disprove other things, like evolution. "Second Law requires a closed system"
Israeli Astrophysicist Nir Shaviv: 'There is no direct evidence showing that CO2 caused 20th century warming, or as a matter of fact, any warming' link to this paper on climate depot. 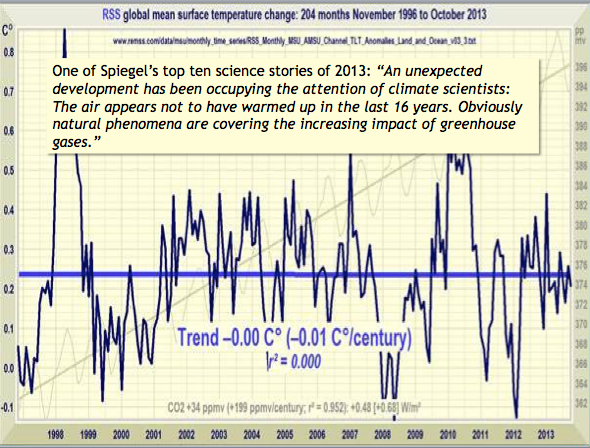 The Great Climate Clash -archives December, 2010 , G3 The greenhouse gas effect does not exist. ( peer reviewed and revised but not yet released). University Professor, Scientific Research Director at Biology Cabinet® San Nicolas de los Garza, N. L., Mexico. The bottom line is that the facts show that the greenhouse gas effect is a fairy-tale and that Man-made global warming is the World larges Scam!! !The IPCC and Al Gore should be charged under the US Anti-racketeering act and when convicted - they should spend the rest of their lives in jail for the Crimes they have committed against Humanity. The sad reality with the AGW crowd is that anyone who dare question their "science" is a crackpot, who is in denial of "the real data" proving their theory to be "the undeniable truth". The entire AGW theory left the realm science years ago when the likes of James Hansen hi-jacked it with his extremists views. (Note is said views since, nothing this man has ever done is based on sound science). The entire AGW camp, in my mind, followed Hansen straight down the religious cult path, where only true believers are welcome. Keep up the good work Joseph, facts and time will eventually win out over this contrived myth. It isn't "religion" driving it but radical leftist political culture. Getting cooler? 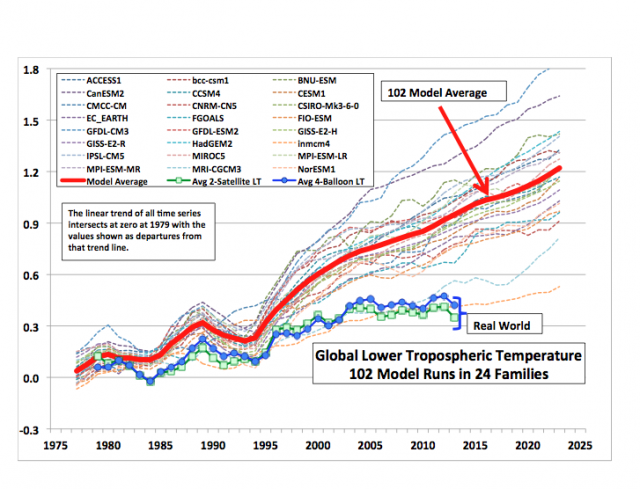 AGW is even more diabolical, twisted, and evil than we realized. Ditch that SUV and send more money NOW!!! great article by Joe D'Aleo and excellent comments from Berthold Klein and others. Thanks to Hockeyschtick for posting climate realism.